#OOTN – Emily Payne Leather Tongue Dress – Let’s Party! 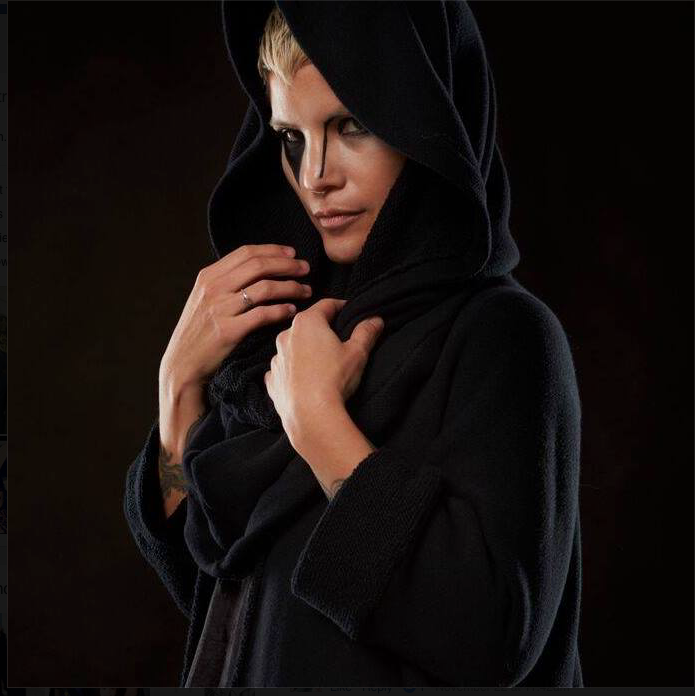 Last weekend, I got to catch up with Emily Payne, the designer of edgy/luxe clothing who you may remember from Project Runway and our posts about her fashion week shows. She, along with three other Project Runway stars, was featuring her collection at a pop-up boutique at Britex Fabrics in San Francisco. I finally got to pick up a piece I had coveted since I saw it in her NYFW show – this one-of-a-kind Emily Payne Leather Tongue dress! This Emily Payne Leather Tongue dress is my kind of edgy. I’ve loved this striking sleeveless shift dress since I saw it during NYFW and then again at San Francisco Fashion Week. My style is always undergoing some kind of evolution. Several years ago, it could have been described as playful and then became more classic with clean lines. Of late, I am exploring edginess, and Emily’s pieces are just the right blend of streetwise grit with luxurious materials. This one is even a little playful! 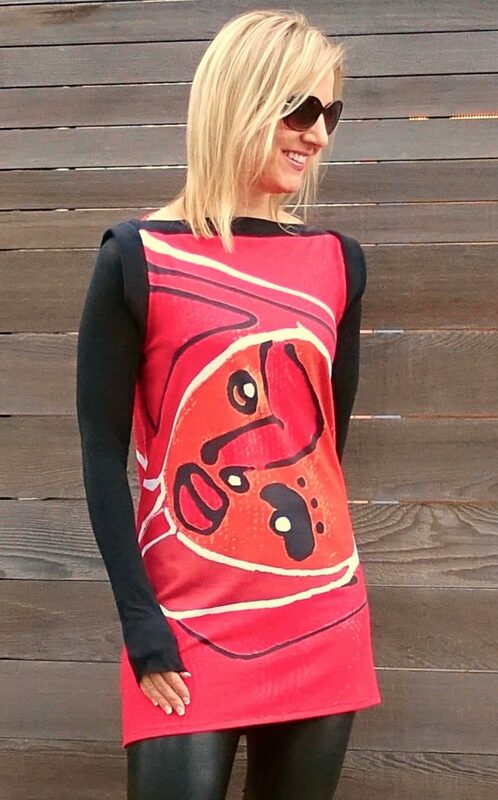 The dress is not at all flimsy and is so smooth and soft, with a wild print designed by artist Mary Rosenberger. You can see that the garment falls so nicely over my curves. It actually seems to defies the laws of physics and esthetics, because it is soft and yet preserves a cool geometric shape without making me look wide. I’m showing you how I would style the dress for the holidays, because I can’t wait for warm weather to wear it! 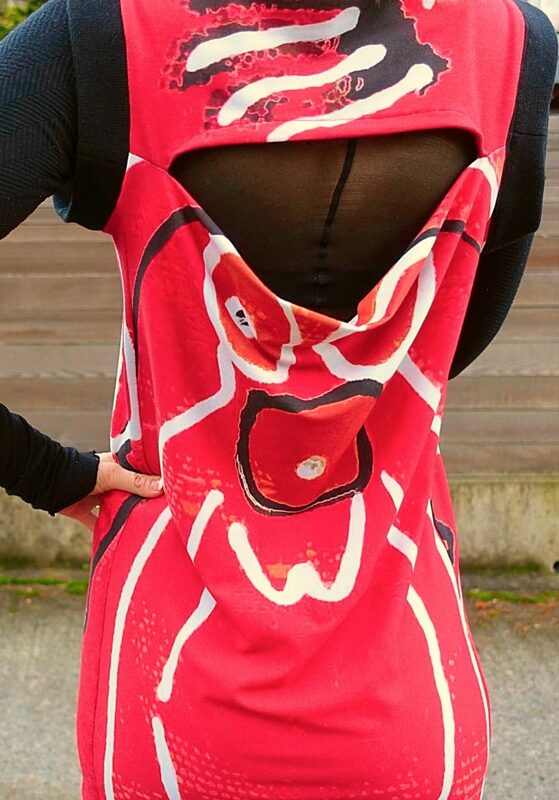 The dress is perfect for the holidays! I could definitely wear it at a party with black tights and pumps or sandals. But for this outdoor photo shoot, faux leather leggings and booties seemed like the way to go. (I’m not in California anymore!) And for warmer weather, I can’t wait to wear it with bare arms, bare legs, and sandals. I am so, so happy with my Emily Payne Leather Tongue dress. I haven’t yet invested in one of Emily’s hoodies – her most iconic pieces. But, stay tuned to see a super cool one-of-a-kind jacket I also purchased from this amazingly talented designer! And please let me know what you think of how I styled this party look. 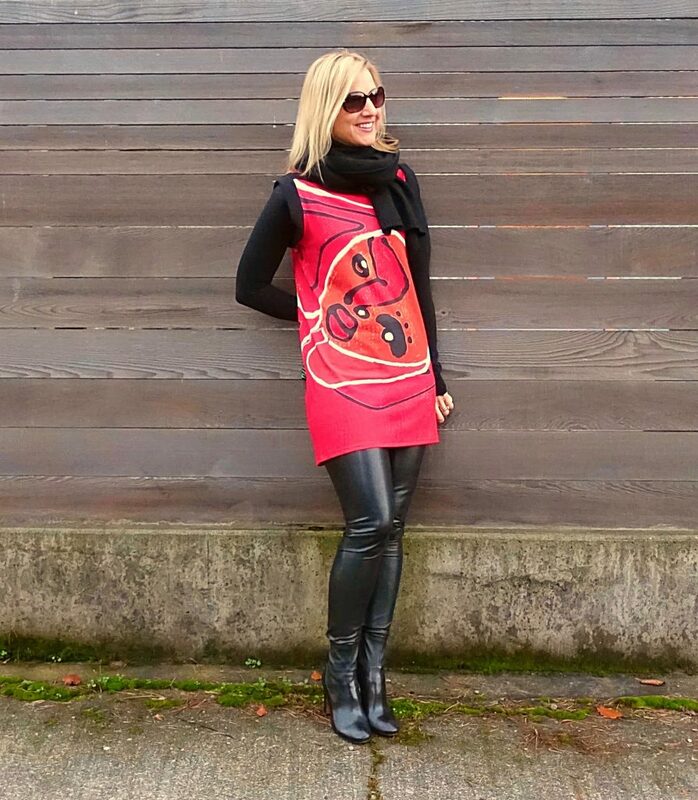 You’ve adapted this dress for the cold weather really well – such a fun, colourful print! More than anything though I’m totally distracted by these drop dead gorgeous leather boots-leggings! Wow! The dress looks great on you! It’s such a dynamic peice! 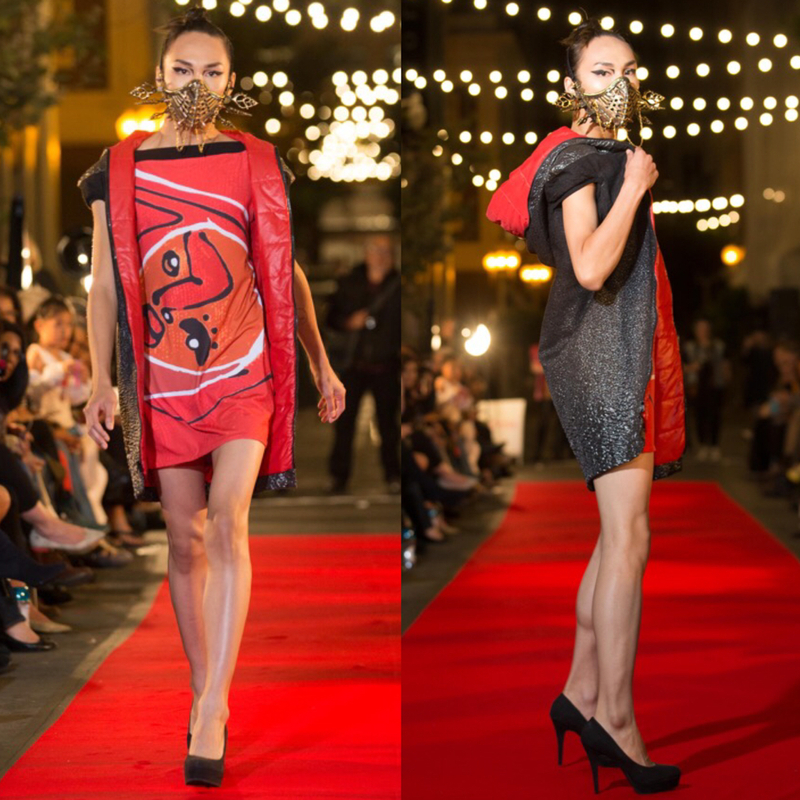 And I just realized that you now own (along with my mask) the entire look from the runway! lol – awesome!